Bioleaching processes in mechanically-agitated tanks are usually applied for the treatment of flotation concentrates derived from sulfidic ores. The valuable components in these concentrates can be gold, uranium and a variety of base metals such as copper, nickel, zinc and cobalt. Bioleaching is an attractive option for treating complex concentrates containing several of these valuable components, or for treating dirty concentrates that contain small quantities of elements that will attract smelting penalties. It is estimated that about one third of the world’s gold is produced from refractory ores, and this proportion is growing as oxidised, near-surface resources become depleted. The most common cause of refractoriness is the association of the gold with sulfide minerals such as arsenopyrite and pyrite, by physical lock-up in the sulfide grains or by substitution in the sulfide lattice. This results in poor recoveries (as low as 10 to 20 per cent) by direct cyanide leaching. Several process routes are available for breaking down the sulfide minerals and exposing the gold for subsequent leaching, including roasting, pressure oxidation, and bioleaching. No airborne pollutants are produced, and the solid and liquid wastes are environmentally acceptable. Simplicity of design and operation makes the technology suitable for use in remote locations, with low-level operating skills being required. Start-up times are short, and capital and operating costs are favourable. As a result, bioleaching of refractory gold concentrates in agitated tanks has become an established commercial process over the past 25 years, and Mintek is one of the leading technology suppliers. 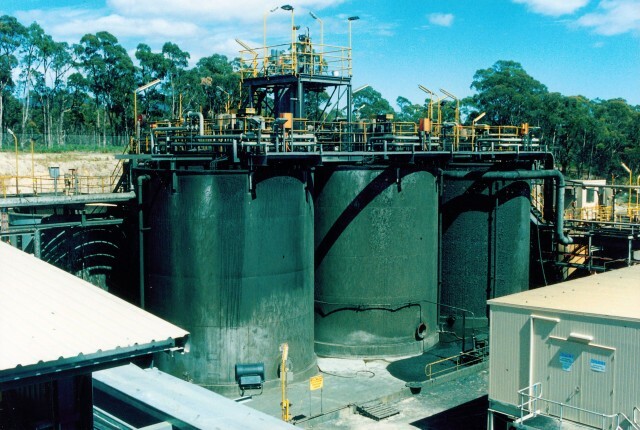 A Bacox™ gold bioleaching plant, designed to treat 70 t/day of a refractory pyrite-arsenopyrite concentrate, was commissioned at the Tasmania Mine (formerly the Beaconsfield Gold Mine) in Tasmania, Australia in 1999. Near-complete oxidation of the sulfides results in a gold extraction in excess of 95 per cent. Mintek has developed and refined the process fundamentals of the Bacox™ technology, and procedures for testing the amenability of refractory gold ores to bioleaching are well established. An extensive database has been compiled which contains process kinetics and the scale-up requirements for mixing, cooling and aeration. Using this database, a comprehensive computer-based design package was developed that enables rapid evaluation of process designs, using parameters obtained from amenability test work. The technical and commercial success of refractory gold bioleaching projects sparked renewed interest in applying the technology to base-metal sulfide processing. Mintek has developed a considerable understanding of the chemical and biological reactions and mechanisms involved. A wide variety of sulfide concentrates, including complex polymetallic sulfides, has been tested. This has enabled Mintek to adapt microbial cultures and establish operating parameters for concentrates with widely different mineralogical compositions. A particular achievement has been identifying the requirements for bioleaching chalcopyrite from complex or impure copper concentrates with acceptable kinetics. Secondary copper concentrates containing minerals such as chalcocite, digenite, bornite, and covellite. Concentrates containing primary copper sulfides (predominantly chalcopyrite). Complex polymetallic concentrates, such as those containing sphalerite, galena and chalcopyrite, or pentlandite and chalcopyrite. These complex concentrates often also contain contaminants that attract smelting penalties, making bioleaching an attractive alternative. Lower-grade deposits that are not suitable for smelting. A major advantage of bioleaching of base metal concentrates is that the SO2 pollution associated with smelting is avoided, and environmentally acceptable wastes are produced. The bioleaching process can be fully integrated with downstream metals recovery processes. For example, solvent extraction and electrowinning (SX-EW) can be applied to produce LME A-grade copper cathode, and precipitation processes can be employed to produce metal intermediates (such as hydroxides, carbonates or sulfides). Precious metals can also be recovered from the final bioleach residues. 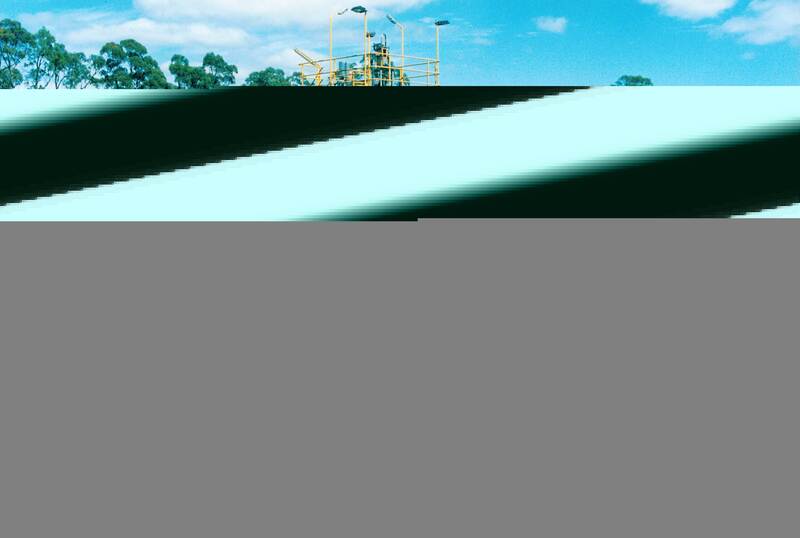 This technology is particularly suited to instances where producers wish to continue using established SX-EW facilities as their oxide resources become depleted, or where the on-site production of metal is required for strategic reasons. A fully integrated pilot plant was operated at the Mount Lyell Copper Mine in Tasmania, Australia, treating a high-grade chalcopyrite concentrate. Copper extraction was over 90 per cent, and the leach liquor was purified by SX-EW to produce premium-grade cathode copper. A 500 kg/day demonstration pilot plant with integrated SX-EW facilities was commissioned and operated at the Industrias Peñoles facility in Monterrey, Mexico, during 2001. The plant produced more than 40 tonnes of LME A-grade cathode copper from a complex polymetallic, chalcopyritic feed concentrate. In 2008, two fully integrated pilot plants were operated. In one instance, the feed was a low-grade chalcopyritic concentrate from the RTB Bor Copper Complex in Serbia, and in the other the feed was a low-grade nickel-copper concentrate from the Aguablanca Mine in Spain. At the conclusion of these pilot campaigns, pre-feasibility studies were conducted which indicated that the economics of the processes were favourable. Mintek’s Biotechnology Division is equipped with a wide range of specialised equipment which enables the metallurgical testing of concentrates, to assess their suitability for processing by bioleaching. Continuous bioleach test plants with volumes from just a few litres to ones with volumes close to 100 litres are available, enabling test work programmes can be tailored to meet the client’s needs. Often, only very small quantities of concentrate samples are available, and the smaller equipment can be used to obtain continuous data without requiring large samples. The smaller equipment can also be used to undertake a rapid assessment of a wide variety of operating conditions – such as grind size, operating temperature, pH level and overall residence time. The larger equipment can be used for process optimisation, and for generating sufficient quantities of product pulp for further metallurgical testing of the downstream processes, such as solid-liquid separation, iron removal, solution purification and metals recovery. The bioleach testing rigs are complemented with state-of-the-art equipment for measuring important process parameters. In particular, gas analysis equipment enables direct measurements of the all-important oxygen and carbon dioxide rates to be made, which provide instantaneous indications of the oxidation and biological growth rates in the bioleach reactors. 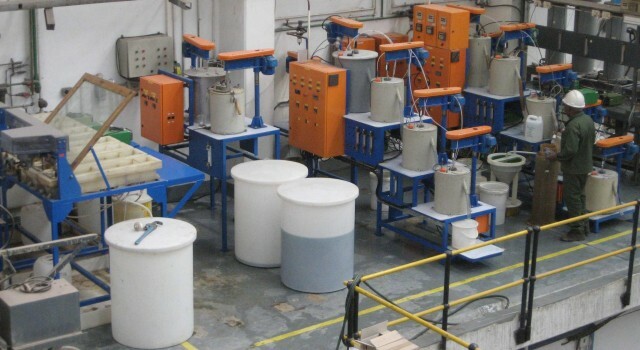 Mintek’s Biotechnology Division has over 25 years of experience in the testing of a wide range of tank bioleaching processes, and this expertise underpins the metallurgical test work programmes offered by the Division.